"The name CascaZilla is a play on both the name of our local Cascadilla Gorge and the monster amounts of Cascade hops in this beer. This red ale gets its distinctive color from a healthy portion of caramel malt, which also lends some body and sweetness to the beer. The predominant flavor and aromoa of this beer, however, is brought to you by the fresh American hops. 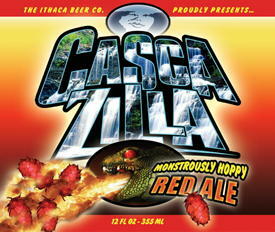 If you haven't done so yet, treat yourself to Ithaca Beer's new monstrously hoppy Red Ale." -- Ithaca Beer Co. Pours a light amber color with a fizzy, white head. Clear body with a mostly diminishing head with good lacing. Aroma is of tea and honey. Initial taste is moderately bitter, moving to a light bitter finish. Light on the palate, it has soft carbonation with an oily/creamy texture. Reviewed on December 18th, 2006.